When it comes to small busi­nesses, web­sites are very impor­tant for the pur­poses of mar­ket­ing and brand­ing. If a web­site is designed in an incor­rect way, it will not only lead to loss of money that was invested, but will also dimin­ish the poten­tial rev­enue that could be achieved. So, the impor­tance of a well-designed and func­tional web­site can­not be empha­sized enough. How­ever, there are some com­mon mis­takes that busi­ness own­ers usu­ally make while design­ing their com­pany web­site. 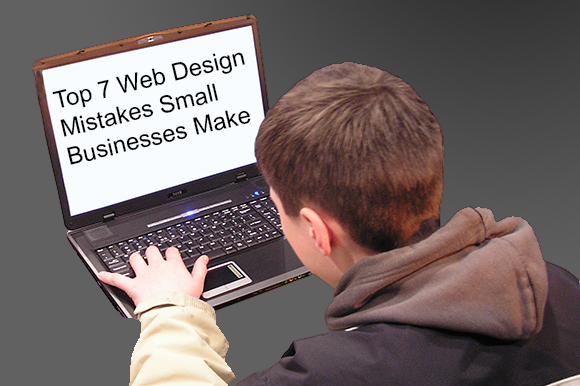 So, read fur­ther to under­stand the top 7 web design­ing mis­takes that all small busi­nesses must con­sciously avoid. Not pri­or­i­tiz­ing the tar­get market. Before focus­ing on get­ting a web­site design com­pany to cre­ate your web­site, it is nec­es­sary to first research about the audi­ence. Ensure to pro­ceed only after find­ing out the exact needs of your tar­get audi­ence. So, for instance, if the tar­get audi­ence com­prises of older peo­ple, the web­site needs to have a large font size to enable ease of read­ing. Any busi­ness can eas­ily deter­mine the area they want their users to visit, by first by prop­erly under­stand­ing the tar­get market. When a web­site design com­pany cre­ates a well-designed web­site, it attracts more users to it which proves prof­itable to the small busi­nesses. Also, many users have started vis­it­ing web­sites through their mobile phones or tablets. If the web­site has a flashy design, it becomes dif­fi­cult to view it on these gad­gets. There­fore, a sim­ple and easy to nav­i­gate web­site will help the com­pany to show­case its prod­ucts, and enable users to locate and pur­chase them with­out any dif­fi­culty. It is nec­es­sary to get the web­site design com­pany to empha­size on the poten­tial user’s require­ments rather than focus­ing on mak­ing it flashy. A com­pany can largely help its users to nav­i­gate through dif­fer­ent web pages by cre­at­ing a well-designed and sim­ple to use web­site. This will enable them to pri­or­i­tize which pages are more impor­tant than the oth­ers. If the prod­ucts and ser­vices have been dis­played in an impres­sive man­ner then it can drive the user’s inter­est. This can make them sub­scribe for the company’s busi­ness e-newsletter or even pur­chase the product. Pay­ing a lot or not pay­ing enough. It is of utmost impor­tance to invest in a good web­site design com­pany. There are many expen­sive agen­cies that work for top brands. How­ever, they may not be ideal for small busi­nesses that focus on Return on Invest­ment (ROI). So, it is impor­tant to hire a web­site design com­pany that can pro­vide a well-designed web­site within the budget. It has been found that web­sites get more num­ber of users when they update their con­tent every few days. The updates can be about the company’s prod­ucts, ser­vices or any good event. Those web­sites that don’t have newer updates, tend to lose their cus­tomers. Sim­ply put, a web­site with­out new updates usu­ally sig­ni­fies that it is inac­tive or the com­pany is out of busi­ness. So, it is essen­tial to update the web­site at reg­u­lar inter­vals to attract more users. It is not prefer­able to tar­get every user who vis­its your web­site. So, small busi­nesses need to find out their tar­get mar­ket and what their expec­ta­tions are. The users who fre­quently visit a web­site can be con­sid­ered as the tar­get audi­ence by the com­pany. It is essen­tial to tar­get these poten­tial users rather than every user who vis­its the website. Users get first-hand expe­ri­ence about a company’s prod­ucts through its web­site. A poorly designed web­site can cre­ate wrong impres­sion about the brand. There­fore, it becomes essen­tial to hire a good web­site design com­pany. This helps in attract­ing more poten­tial users. A sim­ple and well-updated web­site will enable a com­pany to attract more poten­tial cus­tomers towards it.